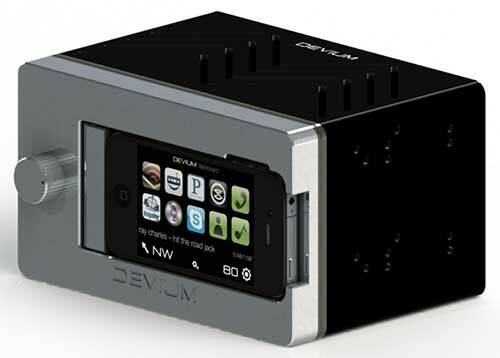 The Devium Dash is an interesting concept in car stereos. It’s a two component system that consists of a faceplate and a body. The body (shown above in Black) is installed in your dash in the spot where your current car stereo resides. It interfaces with your vehicle’s speakers. The faceplate connects to the body with magnets. It’s designed to hold (and charge) an iPhone 4/4S. Once installed, you can use your favorite music apps, calls, GPS, etc through your car’s speakers and you won’t be required to learn a brand new interface. It’s a cool idea, but I am skeptical about the longevity of the product. Devium claims “No matter how frequently you update phones, Dash will be there ready to support you. Our innovative interchangeable faceplate design allows you to keep your phone at the center of your car.” That remains to be seen. I don’t believe that they will create a faceplate for every phone that comes on the market. Their iPhone 4/4S version is available for pre-order at $289. I have been looking for a replacement for my Mazda’s stereo, but I don’t think this one will be it. Create a faceplate for every phone on the market? No, probably not. Saw their video on the kickstarter site. The one with him using it in the car looks dangerous because of how low the Dash is placed. He actually have to take his eyes totally off the road and look down to operate the Dash. The missing feature is voice control. If there was a button for Siri (or similar) then simple functions like changing stations would be effective and safe. This technology is already available in some luxury cars and works! Marcy. Interesting concept. However, since the only interface is the iPhone (or whichever phone you are using) why use the faceplate? There are numerous windscreen etc holders on the market and the only interface needed is bluetooth for audio. Ok, you may want to charge your phone once in a while but thats doable. Really you could hide the whole thing away and just use your phones interface and avoid the need for the clumsy front panels. @Soren I would rather not use my phone as my stereo. I find that interacting with a capacitive display while I’m trying to pay attention to driving is a real pain. I’d rather have a nice stereo with dedicated buttons and knobs. @Julie – what if you could control it using speech – like Siri? That would be a good alternative… but I’ve not been overly impressed with Siri. It seems like every other time I try to use it, it is either laggy to respond, or doesn’t at all. Also, using Siri to control your music would chip away at your data allotment every time you changed songs or volume. Good first step, but I like to use AM/FM local radio too (Traffic Info Updates, news, etc).